Taken 2005. Hopewell House Front View #1. 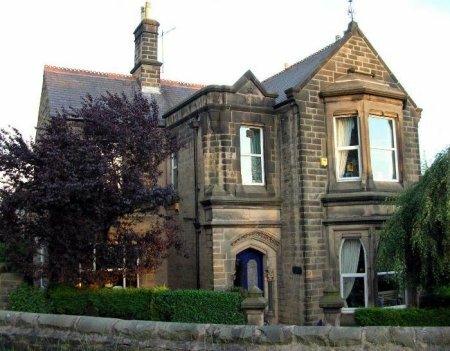 Hopewell House is a superb example of a Northern English high-Victorian stone built Villa/town house that time forgot. It retains around 80% of its original features, externally and internally. 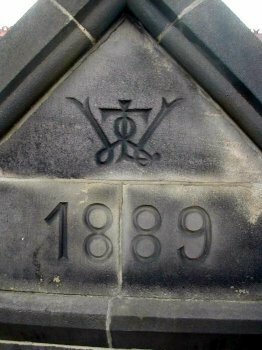 It was built by a local master stone mason-builder (Lawrence Thomas Wildgoose) in Matlock Bank Derbyshire in 1889 (the date and his initials LTW are carved - above the tall central window on the first floor above the main entrance to the house). Hopewell House probably survived largely intact because it was never owned by individuals wealthy enough to modernise it in the 1950s '60s and '70s. This is a view of the stepped front elevation facing North West down the Derwent Valley towards Chatsworth, the seat of the Dukes of Devonshire, and is taken from the garden of the small cottage opposite. Taken 2005. Hopewell House Front View #2. The buildings to the left of Hopewell House are the original stable's block of the builder. He also built larger worskshop block behind the house - glimpsed behind the right hand corner of the house in this photograph. These two buildings are currently being converted into apartments by a property developer. Taken 2005. The builder's and date stones of Hopewell House. These are located high above the front entrance and photographed during roof repairs in 2005. The LTW stands for Lawrence Thomas Wildgoose, the builder. The stone is the local Millstone Grit, a high quality sandstone which made excellent millstones, hence its name. ....having invested so much of ourselves and our income on the restoration of Hopewell House (including rescuing it from dry rot in the front) and having had the privilege of living in such an atmospheric and beautiful house, and such a beautiful area, for seven years, it has not been an easy decision to reach. But we will always have the satisfaction of knowing we have almost fully restored (if we had had the money we would have put back all 19 windows which locals say were of wonderful quality) a high Victorian gem of a town house and that it should now be safe for posterity from 'modernisation.' Although the County Architect who visited Hopewell House last year told me that very sadly he could not protect it under listing because of its period and because it 'only' had around 75-80% of its original interior and had not had someone famous living in it, so it is not yet completely safe from philistines. He told me that he had droves of Grade II listed building in Derbyshire with one tenth the character and original features of our house inside and out, but they were much older and therefore automatically qualified for listing). My research on Hopewell House has been a final labour of love connected to the house, and as a scholar a rewarding activity in its own right. What is has also thrown up is that Matlock Bank's economic base in 1899 was powered largely by Hydrotherapy institutions, hosiery manufacture, and stone masonry/building activities as the housing stock expanded rapidly to accommodate the new found wealth created by visitors to Smedley's and Rockslide etc. Rockslide is now fully converted to luxury apartments by the way. We can see it from our kitchen window. For a long time we all thought it would simply fall down as the original contractor built some luxury house in the grounds and then did a runner forcing the council to take repossession of it in 2002/3, but not before the Ballroom had collapsed. Still, in the end most of it has survived with a new and more honest contractor stepping in - thank goodness. The views from it are, of course, simply stunning! [Thanks to David Baker for the following description and history of the house he has lived in for 7 years. 31 photos of the inside and outside of Hopewell House, with accompanying text can be found on David's website at www.yessy.com/DavidBaker/Home.html. Built in 1889 by Lawrence Thomas Wildgoose, variously registered in the 1881-1901 censuses as a stone mason and builder/contractor. In the 1891 Census he is recorded as aged 35 and living at 40 Wellington Street with his wife Annie (46), sons Antcliff (15) and Laurence Thomas Jr. (10), and daughters Rachel (13) and Gertrude (6). Along with James Antliff, the brother of his wife. * The spelling of Lawrence's name changes between censuses as does that of his wife in the 1901 Census return. See Appendix 2 below for a fuller list of the important local Wildgoose's of the period. Wildgoose's initials "LTW" are beautifully intertwined in foot high letters under the 1889 date stone above the main entrance to Hopewell House. It is likely that as a master stone mason by training he carved these letters himself. Lawrence Thomas Wildgoose was a member of the family famous for founding the Wildgoose building company, which still exists in Derbyshire as a multi-million pound construction business, and for providing generations of contributors to the local politics and the administration of the town. John William Wildgoose (see Appendix 1 below) was, like Lawrence Thomas, a Stonemason and became the Founder of Wildgoose Construction. He also lived in Wellington Street, and later Holmebank, Matlock. He was heavily involved in local affairs and erected the War Memorial in Matlock at a cost of £500 and unveiled on 13th. August 1921. He died in 1934 aged 73. The Wildgoose name is rare and largely local to the Matlock and Derbyshire area. Aside from the well known civil engineering side of the family, they have provided solicitors and elected local council officials over several generations in the town. Lawrence Thomas Wildgoose purchased the land to build Hopewell House from Richard Farnsworth by a deed of covenant on 4th January 1889, for one hundred and thirty five pounds and eighteen shillings, in order "to erect a messuage or dwelling house and other buildings thereupon." Hopewell House and two large stone outbuilding (builders workshops and stables for horses) was completed within the year given the date stone of 1889. The only Farnsworth's registered in Matlock in the 1891 Census are George Farnsworth (aged 57 the head of family "living on his own means"), his wife Fanny (58), his son Leasone (33 - a soldier on furlough from South Africa), and James his brother (53 - also "living on his own means"). They also lived in Wellington Street (67), the same street in which the builder Wildgoose's lived and in which Hopewell House was built, which suggests that this could well be the family, especially as Mr Farnsworth and his brother were not recorded as having any profession, but rather each as "living on his own means". 29th May 1846 from Thomas Leys to John Farnsworth. 9th May 1874 Richard Farnsworth, Anthony James Farnsworth, George Farnsworth, Charles Farnsworth and the wife of Joseph Smith and Esther Farnsworth, to the use of the said Richard Farnsworth. 9th May 1874 From Richard Farnsworth to the use of William Spencer. 30th January 1878. From William Spence to the use of the said Richard Farnsworth. It is not likely that Thomas Wildgoose ever occupied his wonderful new town house, since he is registered at other addresses in both the 1891 and 1901 censuses. But as there is no census record for 1891 for 2 Wellington Street (or for 1 and 3-7) to verify this. What is clear is that by the 1901 census a William R. Swindell (a middle class "Stone Merchant" aged 42) was occupying the house with his wife Fanny aged 40, and six children, Mercy (13), Harold (10), May (7), Millicent (6), Fanny (3) and Arthur (10 months). 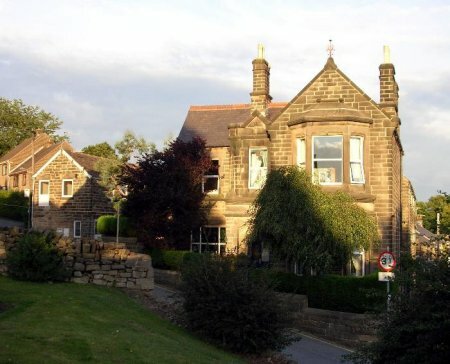 In the 1891 Census William Swindell and his family were living at 59 Rutland St, Greenhill Terrace, Matlock, at which point he was listed as a "Stone cutter", so he has achieved a considerable betterment of himself in only ten years in coming to occupy the Victorian respectability of Hopewell House. It appears likely that Wildgoose was either forced to rent the house and re-mortgage the property because of difficult times for his building business after 1889 and the need to raise capital (Hopewell House and its considerable workshop/stable outbuildings would, after all, have cost a great deal of capital to build to such a high quality), or that he built it as a speculative investment to sell or rent and had his initials carved on it so prominently it because he was proud of the quality of the workmanship throughout the house and wanted to advertise his abilities. His reduction from the profession of Builder/Contractor to Stone Mason between the 1891 and 1901 censuses, and the loss of his live in servant in the household too, suggests that the former hypothesis may be correct and that the losses incurred on building Hopewell House and its extensive outbuildings could have ended, at least temporarily, his aspirations of running his own building/contracting business. By 1915 Hopewell House and its outbuildings were in the hands of Liquidators, because the Crompton and Evans Union Bank which owned the land and buildings, had gone into voluntary liquidation. According to the agreement to sale drawn up by the Bank's liquidators in 1915, Lawrence Thomas Wildgoose had sold (or remortgaged) Hopewell House and its outbuildings to the Crompton and Evans Union Bank on 31st August 1891. A Derby based Bank (Old Bank) acting as liquidators (in the persons of Robert Hugh Tennant and Matthew Attwood - "Bank manager") sold the house and outbuildings to the Matlock Bank Industrial and Provident Society (i.e. local CO-OP) on 28th September 1915. Wildgoose received £1500 from the Bank in 1891 - the CO-OP paid only £1100 for it in 1915. The deeds for this offer the first record of the house under the name of "Hopewell House", but it most probably existed under this name from 1889, or shortly thereafter. At that time the CO-OP acquired it (1915) Hopewell House is recorded as have resident within it the "Misses Radford" and Kelly's Directory for 1916, under "Matlock Private Residents" (meaning important people in Matlock) lists a John Radford as living in Hopewell House, perhaps they were his unmarried sisters, or his unmarried daughters having lost his wife. Hopewell House was sold in 1915 as liquidated stock "together with the joineries and numerous workshops and other buildings in the occupation of Thomas Growden (or Gowden) Johnson" and "together with the Gaitsheds and other buildings in the occupation of the Society [clearly they had already rented some space on the property] erected on the four said parcels of land". In May 1919 that the Matlock Bank Industrial Provident Society changed it name to Matlock and District Co-operative Society. Ironically the chairman of the first General meeting of the new CO-OP was one Bertie Farnsworth - probably a relation of the family which had owned the original land in the mid 19th century and who sold it to Wildgoose in 1889. The dealing surrounding Hopewell House and its ownership proved a very incestuous business. The CO-OP's registered offices remained as before in Smedley Street just below Hopewell House. The CO-OP continued to occupy the whole site until it too went bankrupt in 1968, when the house and outbuildings passed back into the hands of private individuals. It has therefore been part of bankrupt stock twice in its 120 or so years of existence. Hopewell House may, therefore, have been rented continuously since 1889, or used as a tied manager�s house after 1916, as there was a CO-OP hosiery factory in the outbuildings between the wars, according to locals, and the buildings were used to service milk floats and other CO-OP delivery vehicles in the 1950s and '60s. Various pieces of wood with the CO-OP�s logo on them were found by the owners in the loft during renovations in 2004-5. There are plans (undated) which show that Hopewell House was going to be converted into two apartments by the CO-OP, although it is not clear if it was acted upon by the company since the actual conversion preserved the vestibule screen and had a different orientation for the downstairs bathroom from the plans left with the documents. However it is likely that it was the CO-OP that effected the conversion. Fortunately, whoever did turn the property into two rented apartments, did not remove many of the period features in the conversion. Even though the beautiful stained glass inlaid inner vestibule screen in the lower Hall was moved, it was preserved by turning it around by 180 degrees to move the door to the opposite side and also moved a foot back towards the stairs (the floor tiles mark exactly where it used to stand). And a stud wall was built around one side of the main stair rail to allow entry to the upper apartment from the front door. Locals remember attending student parties in the house as at that time there was a college at the top of the road in a huge former Hydrotherapy building, converted into luxury apartments in 2004. The new owners in 1968 were Arthur Cuthbert Woodhouse and his wife Lucy Jane Woodhouse, of 38 Jackson's Tor Road, Matlock. Ironically, the firm of solicitors which handled the conveyancing was Potter, Brooke Taylor and Wildgoose - most probably a descendent of the original builder and another example of the localised nature of business dealings in this small town. Before the death of Arthur Woodhouse, on April 1st 1985, he and Lucy had moved into Hopewell House "Flats 1 and 2" (as the first ever owner occupiers perhaps) and on the 15th March 1986, Lucy Woodhouse sold Hopewell House to Stanley Graham Irving (a University lecturer) and his wife Pamela Helen Irving (a Sheffield Head Teacher) of West Lodge, Dale Road North, Darley Dale. Pam and Stan, as they were known, are remembered affectionately by locals as complete eccentrics. At the time she resembled Cruella De Vil - of 101 Dalmatians fame - and he was an extremely pleasant person by all accounts. Her taste was extremely flamboyant and extrovert (lots of mixtures of pink, black and gold wallpaper and white rose motifs, and much of this remained when David and Su Baker bought Hopewell House in 1999). The house owes much to Pam and Stan since it was they who reconverted it from two apartments into a single house in 1986-7. They also converted the two main cellars facing on to Hopewell Street into garages in 1986, spending around £4,000 and they had the badly wood-wormed windows replaced with more sympathetic than normal, and very high quality, UPVC double glazed windows in 1988, at a cost of a further £4,000 (by 2005 this would probably cost closer to £20,000 for the 19 panels involved - although the present owners would have preferred it if the original windows could have been saved). The Irving's sold Hopewell House in 1993 to a local nurse, who in turn sold it to Dr David Baker (Warwick University Lecturer) and Mrs. Susan Baker (Stanton in Peak School Teacher) in December 1999. Recognising from the outset the special quality of both the exterior stonework and period interior of this remarkable high Victorian Town House, David and Su Baker set about the major restoration of Hopewell House, spending around £90,000 on the project, and a huge amount of their own time and effort too. By late 2005 they had brought this wonderful town house back to a condition something akin to when it was first completed by Wildgoose late in 1899, which had perhaps inspired him to carve his initials so prominently high on the frontage. Hopewell House has, therefore, survived more than a hundred years of neglect, bankruptcy, conversion to apartments, and multiple rental occupation, to re-emerge as an extraordinary example of a stone built detached Town House/Villa of the high Victorian era. Whoever owns this house is entrusted with looking after a very special building and whoever visits it will remember the experience. (i) Davis Mark served on the Matlock District Council, retiring in 1918. (iii) Ernest Henry was a Second Lieutenant in the Royal Engineers. commemorated on the Poziere War Memorial and on the Matlock War Memorial. in action. I have seen his grave (and left him a poppy) at Etaples Cemetery. The stone is touchingly inscribed: "Think what a boy should be. He was that." (vi) Arthur served in the Canadian army. (vii) Edmund served in the Canadian army. (viii) Norman served in the Saskatchewan Regiment, Canadian Infantry. First World War Book of Remembrance. (ix) Lubin George played the double bass in the Matlock Brotherhood Orchestra.